Evo & Grace: The WanderLusts: "Behind the Doors of Chateau"
"A RESTAURANT BRIMMING WITH STORIES"
Ricky Gutierrez chose a risky, creative business in post-Martial Law Manila instead of a safe trading job in the United States. Chateau 1771 was built on the grounds of his old home. He went into the restaurant business cold – not knowing anything about it, relying on his guts and instincts more than anything else. A life that revolves around food and service is both delicious and challenging. This is the life that Vicky Pacheco chose. From Ecole Les Roches and Ecole Hoteliere de Lausanne, Switzerland, she managed an upscale Filipino restaurant in California, then headed home and found herself in Chateau 1771. “Behind the doors of Chateau 1771” chronicles the restaurant openings, new menus and new kitchens, changing interiors and life lessons the two have racked up over 25 years. It is a road map for others wishing a restaurateur’s creative, unpredictable life. The book is not just about their story. It opens up the world they created. It holds a roomful of stories as different people recount their experiences working for and with the Chateau 1771 Group. The kitchen is Vicky’s favourite room, the place where she is most comfortable. The book is a rare look inside a restaurant kitchen. “Much Ado over Valentine’s Day” reveals the demands of a full house on the cooks. There is camaraderie among Chateau’s kitchen brigades even with Vicky’s strict rules in place. Cooks can convey so much with their expressions and body language and still obey the ‘no talking’ rule during service! Vicky calls her cuisine No Borders – and the book retraces her many journeys to learn about and sample different cuisines. Imagine discovering Europe through Vicky’s eyes and with her palate! Vicky rides planes, trains and even disreputable vans to reach the unusual, artisanal places in different continents. In Vicky’s hands, classic dishes are transposed into something new and exciting for the modern Filipino palate. Vicky once wrote to a younger chef, “Take advantage of everything you learn.” A creative person cannot help but be constantly amazed and challenged by what the world has to offer. Chateau’s high standards compel its staff to hone their skills and develop their character. The front of the house demands grace and personality to meet the expectations of the restaurant’s guests. First, constant recruitment, then, rigorous training, go into creating a service staff that is genuinely attentive to Chateau’s guests. This discreet, caring service allows customers to celebrate their milestones and nurture their relationships in a beautiful place. Ricky is the wizard behind his restaurants’ interiors. Whimsical illustrations and pictures culled from his archives show the evolution of his dining rooms, updated by the wonderful photography of Alan Tuazon. Ricky loves all the details of a restaurant, down to the door knobs and bathrooms. The book follows his meticulous planning and conceptualizing of each space. Ricky’s passion for food and life and Vicky’s commitment to excellent quality are the book’s compelling themes. It is offered up to the creative spirit in everyone. 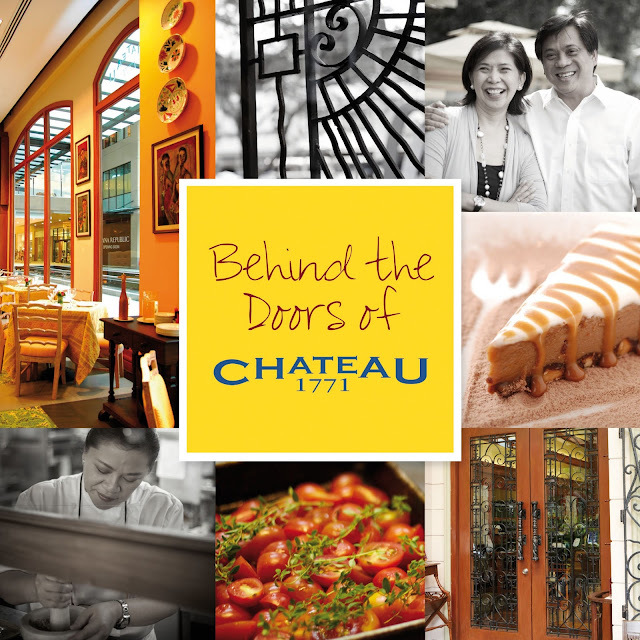 Chateau 1771 – Greenbelt 5 is open from 11 a.m. to 11 p.m. every Sunday to Thursday and 11:00 a.m. to 12:00 m.n. for Friday to Saturday. For reservations, banquets and catering services, please call 729-9760 to 61 or (0917) 8626467. Chateau 1771 is a member of the Chateau 1771 Group of Restaurants that include Sentro 1771 in Greenbelt 3, Sentro 1771 in Serendra, Bonifacio Global City and Café 1771 in El Pueblo Real de Manila, ADB Avenue cor. Julia Vargas Avenue, Ortigas Center, Pasig City.